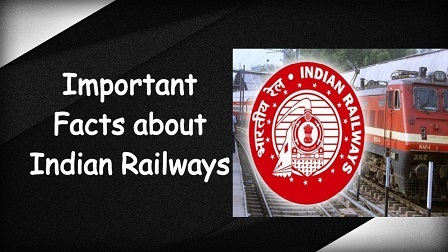 Our Indian Railways is an Indian state-owned enterprise, owned and operated by the Government of India through the Ministry of Railways. It is one of the world’s largest railway networks comprising 115,000 km and 7,112 stations. First train in India – Mumbai to Thane, With 400 passengers, this train completed its journey of 34 kms with the help of three engines–Sahib, Sindh and Sultan. First electric train – Deccan Queen, 1931,connects Mumbai with Pune . First railway station – Chhatrapati Shivaji Terminus railway station in Mumbai. Longest running train -Vivek Express. It runs from Dibrugarh in upper Assam to Kanyakumari at the southern tip of Tamil Nadu. Trains that have placed in Guinness Book -Darjeeling Toy Train, Nilgiri Mountain Train Simla Toy Train, Mathenron Toy Train, Place on wheels Royal Orient, Buddha circular Express, Fairy Queen. First female operator in Delhi Metro – Minakshi Sharma. Railway week celebrated on 10–16April. Busiest railway station in Indian-Lucknow (64 Trains everyday). First blind friendly train, from Mysuru to Varanasi – Train no. 16226/ 16230. Dial 138 for medical emergency on train launched by Manoj Sinha, Minister of State for Railways. Harsh Vardhan, Suresh Prabhakar Prabhu and Prakash Javadekar flagged off the special train(16 coaches) named Science Express Climate Action Special – “Climate Change” – 64 locations. Japan offered to finance India’s first bullet train with an estimated cost of Rs. 90000 crores – Mumbai and Ahmedabad with speed 300km/h and 350km/h. Delhi Metro’s bagged ranked first in“information during travel” and holds second position in “train cleanliness and comfort”. Japanese maglev fastest passenger train across the world, has broken an earlier speed record of 581 kmph as the train reached 603 kmph. First Compressed Natural Gas(CNG)flagged off – two trains(Rewari to Rohtak and Rewari to Bikaner station) from Haryana’s Rewari station. Mobile-‘m-Indicator’ launched for the safety of women-Mumbai suburban trains. Mumbai will get its 1st double-decker bridge on P D’Mello Road at CST that will have railway tracks and a motorway. India’s 1st railway-line built between Gandhidham and Tuna-Tekra Port under PPP model inaugurated in Gujarat. Union cabinet approved a proposal to redevelop 400 railway stations using a contract method called the “Swiss challenge”- 400 stations. India’s 1st Diesel Electric Multiple Unit(DEMU) train service with an air-conditioned coach is launched in Kochi – Ernakulam-Tripunithura-Piravom train service. 1st goods train from Lumding to Silchar in Assam-210Km. Prime Minister Narendra Modi flagged 1st train service from Thalaimannar to Madhu Road in Northern Sri Lanka. Indian Railways IRCTC Launched Ru-Pay pre-paid debit card-24th March 2015. Delhi & Tokyo may ink pact for India’s first Bullet Train – Mumbai and Ahmedabad.